1. To recognize the 200+ riders for having the passion/obsession & stamina to achieve 200mph on asphalt. 2. To energize those people to go even faster by making it easy to see how close competition is. This is just a rough draft from the records I've kept the last couple years. Lots of updates whenever someone has time to add/change. Also, would you prefer ONLY one max speed per person on the list like MOJAVE or class records in addition to outright riders top speed like LORING above?? Personally I would like to see all of it but it's a LOT of info to keep up with and keep updated. What distance does Elvington and Woodbridge run? I couldn't remember if they were 1.4 or 1.5 or what, anyone? This is just a rough draft from the records I've kept the last couple years. Lots of updates whenever someone has time to add/change. or class records in addition to outright riders top speed like LORING above?? of info to keep up with and keep updated. What distance does Elvington and Woodbridge run? I couldn't remember if they were 1.4 or 1.5 or what, anyone? Again, this is a great idea. 1) Not just the records, but the individuals that are over 200 MPH. 2) Results from Elvington, Woodbridge, Pendine and Finland and Russia. 4) The individuals at Loring. NICE work, you are "DA MAN"
Josh, great idea and job. You are the only one that can add people to the list, at this time. 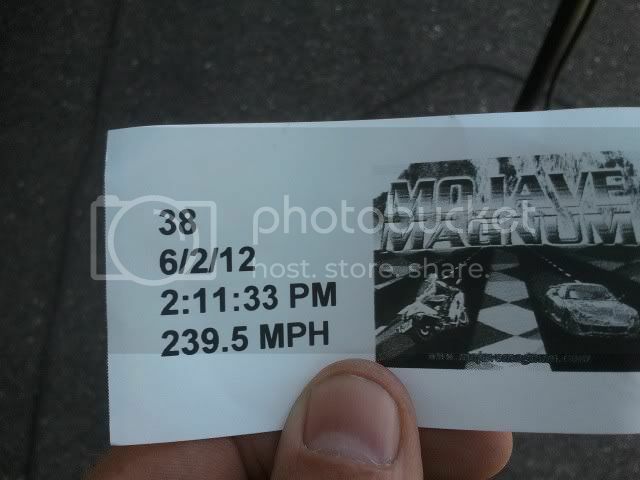 I do think Danny Creedon should have his 239.5 listed at Mojave. He ran the speed but was not teched for that fast. SOOO This is not about records it is about certified speeds. As much as i think Danny is a good guy, I disagree. I understand that the speed wasn't certified by Mojave bc he was in violation. Also, do you want them displayed in order of speeds(record in parentheses) or keep the records/classes separate with the 200+ below? What would the majority like?? Josh, great idea and job. You are the only one that can add people to the list, at this time. I do think Danny Creedon should have his 239.5 listed at Mojave. He ran the speed but was not tech-ed for that fast. SOOO This is not about records it is about certified speeds. Like AMA, Loring, ECTA, etc ? by a sanctioning body ? your time, 'cause you broke a rule, is that still "Over 200 MPH ?" 4) Proper evidence of speeds recorded on GPS - certified or not ? this has the potential of getting way too complicated, you guys sort it out. IMO you only need a ticket from a sanctioned event with yr speed. Danny should not have been given a ticket if he was. A great guy, yes indeed, but the Mojave event does not recognize his 239.5, so why should our list show it? Well, he did the speed. These "lists" don't have "rules,"
they are just for folks that go over 200 MPH. spank him for a bald tire, fine. so he goes on the list. that means he had an "official time"
what does "the list" do ? but he has no "proof......."
You are of course right Karl. You are the 1.0 mile guy, and Josh is the 0.5 and 1.5 guy. Maybe somebody (like Steve Knecum) will do the 1/4 mile guys. Somebody could do the Bonneville guys. all "lists." so people don't get left out, or improperly included. IMO VERY simple, he doesn't get credit for 237.5; its as if it was a GPS speed. entropy over and out on this subject. It's a work in progress so don't be mad with multiples, they will be changed/amended/deleted.....as I get time! Im not trying to cry or stir the pot.... It is just very satifiying to work hard on your project in the garage at night and get some great results. I vote, he goes on the list. He has on official time slip. Also he should get a slap in the head for not having a back protector... Dont do it again. Back protector is on order. Now I just need to loose 15 pounds to get it to fit under the leathers. I was just looking over the run log for the July 2011 Loring event, I couldn't find my timeslips but I knew I broke 200 a couple times. I didn't set a record but did run 201.85 on my best pass. Do I make the over 200 list above or is it only if I set a record? Again, I "vote" him in. He still did the "Speed."